Home | Recent Posts | Library | Xchange Store | Winter Olympics | Contact Us | Volunteer | Site Map | Donate! Click here to read a volunteer testimonial. 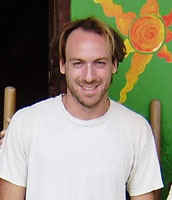 Planet Drum Foundation founder and director Peter Berg arrived to Bahia de Caraquez in the wake of El Niño floods and a 7.2 earthquake which destroyed a large part of the Ecuadorian coastal city of Bahia de Caraquez in 1998. Inspired by the wild natural systems of the Estuary, Pacific Ocean and Dry Tropical Forest, and the movement of local groups to promote urban sustainability and ecological tourism, Peter decided to put Bahia de Caraquez in Planet Drum's spotlight of Bioregionalism. 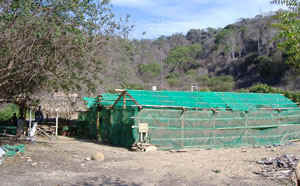 Over the years, and with the help of countless volunteers, Planet Drum has developed ecosystem restoration techniques that are unique to the challenges presented by working in an urban/semi-urban environment, alongside Third World development plans, and in a country with a poverty rate of roughly 60%. True to the principles of Bioregionalism, Planet Drum's projects in Ecuador are focused on ecosystem restoration and education. Due to the nature of being a low-budget not-for-profit organization, local methods of remanufacturing, reuse and recycling are present throughout our work. Revegetation: Through an agreement with a local university, Planet Drum was given the space to construct and operate a greenhouse which now produces thousands of native Dry Tropical Forest saplings representing numerous species each year. 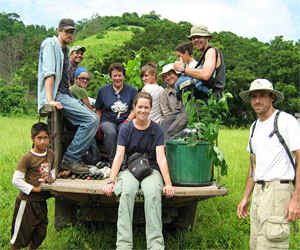 Local land owners are recruited, and sometimes even seek us out, to participate in the program. In exchange for providing the hillsides for our sites and a promise to protect the trees in the mid- to long-term, Planet Drum and its force of volunteers design, prepare, plant and maintain revegetation sites on their land. Since this project's beginning, Planet Drum has planted over 30 revegetation sites on approximately 60 hectares of land. The highlight of the program is 'El Bosque en Medio de las Ruinas' (The Forest Amidst the Ruins), where 6 hectares of a destroyed neighborhood have been completely revegetated with native species, only 3 blocks from the city center. For detailed information about recent progress of the revegetation program, read 2011 Field Reports found here. Education: The Bioregional Education Program began in 2004 with the help of a previous volunteer, Valentina, who returned to Bahia to develop a plan for teaching local kids about Bioregionalism. Since then, the program has grown into a 12-week education program with bi-weekly classes, run by local school teacher Ramon Cedeño. A 40-page booklet and set of worksheets were created that teach kids about the local ecosystems and sustainable living practices specific to the Bahia de Caraquez environment. One 12-week session begins in May and a second in September. Depending on funding, between 15 and 45 students benefit from this program annually. 2010 Bioregional Education progress reports are available here. Volunteers are needed to help further Planet Drum’s year-round revegetation efforts and can assist with the Bioregional Education Program when it is in session (May through December). Because of the hands-on nature and delicate approach we take to revegetating, most of the work we do involves physical labor. Planting sites are located on hills (for erosion control) and all of the necessary equipment for planting and maintaining the sites is delivered by public transportation and on foot. 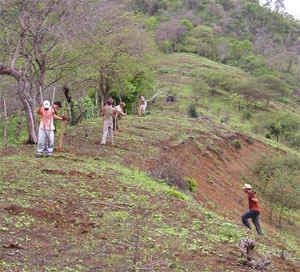 This includes carrying water, trees, holes diggers and machetes to the sites to prepare, plant and maintain them. Since we are restoring damaged ecosystems, access to the sites can be difficult. Volunteers work for approximately twenty hours a week (Mon-Fri 8am-12pm). Because of the seasonal nature of the work, the amount of time volunteers spend on specific tasks varies greatly depending on the time of year. 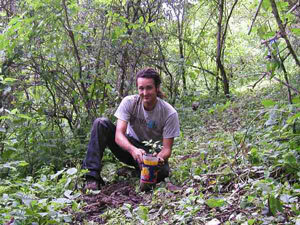 For example, tree planting only occurs during the rainy season—roughly January to April. The rest of the year is spent cultivating trees in the greenhouse, watering old sites, and preparing new sites for planting. Check the field reports from previous years for the time of year you plan on visiting Bahia [LINK] for descriptions and pictures of the work for that period. We are looking for motivated individuals who are dedicated to the environment and are not afraid of working in a tropical climate. 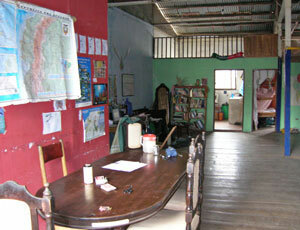 There are additional skills that are not directly related to the field work in Bahia but that are also useful. These include previous experience working in the non-profit sector or community organizing, creative or artistic tendencies, or practical skills such as carpentry or electrical work. Planet Drum encourages volunteers to contribute their specific talents to the project. At least one month as an active volunteer, preferably two to three months or even longer. Time tends to move rather quickly here, and it can take a few weeks just to get settled and familiar with the new environment. Preference in acceptance is given to volunteers who sign up for longer stays. Afternoons and weekends are free for volunteers to hang out on the hammock, relax on the beach, surf in nearby Canoa, swim in the Pacific, visit nearby organic shrimp and plant farms, canoe through the mangrove forests wilderness hiking or whatever else interests you. Planet Drum is a very low-budget non-profit organization. We do not charge volunteers to come and work. However, volunteers are responsible for paying for their own travel expenses, including arrival to Bahia and daily bus rides to and from planting sites and the green house (one-way on city bus costs only 18 cents). There is a $25 monthly fee to cover utility expenses and wear and tear on the apartment, and volunteers can expect to pay about $10-15 a week for communal dinners, drinking water, toilet paper, etc. Volunteers are responsible for providing their own breakfast, lunch and snacks. Living costs in Ecuador are low and food at the local market is cheap. One can expect to spend between $200 and $300 a month total depending on how frugally or extravagantly one travels. 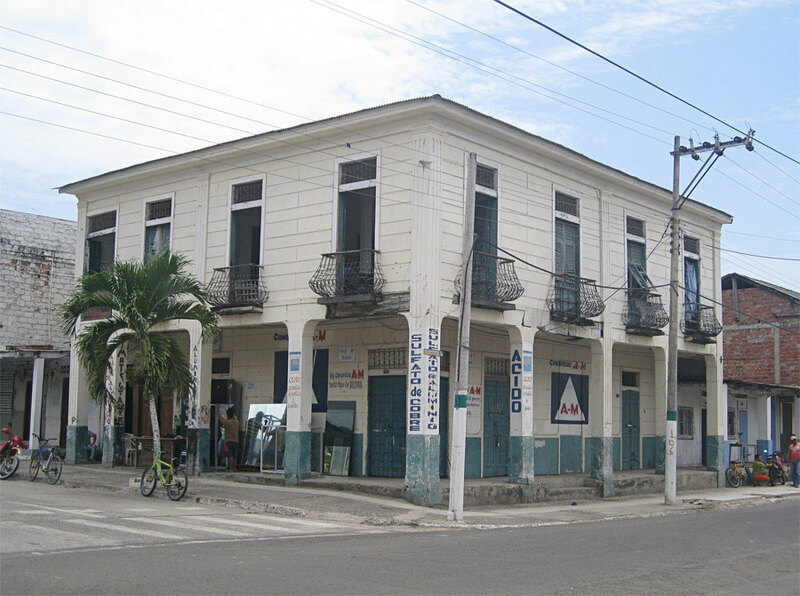 It is located in the bustling center of Bahia on the second floor with lots of windows that provide a nice breeze to combat the warm climate. The river is 2 blocks away and the ocean about 5 blocks. It's right around the corner from the daily produce market and several bakeries. Food here is good and cheap, with an abundance of seafood. Set meals in local restaurants are around $2 for juice, soup, and a choice of meat usually served with rice and lentils. The town is safe (compared with some other parts of Ecuador and South America), clean and friendly. 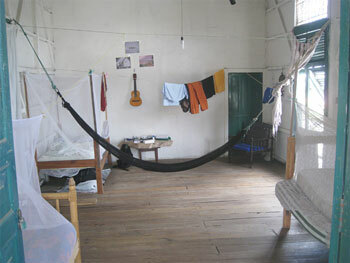 Beds come with pillow, sheets, and mosquito nets. There isn't internet or phone in the house, but there are fast internet cafes nearby for about $1/hour and pay phones with varying costs. Potential volunteers should see about getting all necessary immunizations before arriving—check with the U. S. Center for Disease Control. Foreigners no longer need a visa to enter and stay in Ecuador for up to 90 days. Stays for longer than this period will incur a fine upon over-stay of at least $200 US, unless you seek an extension or acquire a specific visa. You may also apply for a volunteer visa before you get here by visiting the nearest Ecuadorian Consul or Embassy. This grants you a longer time in-country but must be applied for only from outside Ecuador, and it incurs a cost. Whatever else you need to be comfortable in a tropical beach town. 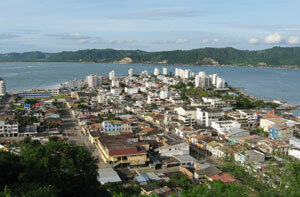 Bahia is a small city, so anything minor you forget will probably be found around town. There are general stores, convenience stores, a number of pharmacies, etc. A resume or a letter describing your relevant education, work or life experience. What specific skills and insights have you acquired from past education, jobs or travel that will contribute to your ability to volunteer for us? A summary of your intentions, for example, what do you hope to bring to and gain from this experience. What dates are you available to volunteer? Why are you drawn to this type of work and how will this experience contribute to your own personal growth? Are you comfortable living communally (i.e. living in close quarters, cooking communal dinners and cleaning up responsibly after yourself and others)? Planet Drum Foundation es una organización no gubernamental y sin fines de lucro fundada en 1973 por Peter Berg con el propósito de disponer, fundamentalmente, una efectiva aproximación a la ecología enfocada en sostenibilidad, la autodeterminación comunitaria, y la independencia regional. En asociación con activistas y ecologistas de la comunidad, Planet Drum desarrolló el concepto de una bioregión: un área distinta con coherentes e interrelacionadas comunidades de plantas y animales, y con sistemas naturales muchas veces definidos por una cuenca. Una bioregión es un entero “lugar de vida” en sí mismo con requisitos únicos de la vivenda humana, para que el lugar no sea perturbado ni dañado. A través de sus proyectos, publicaciones, presentaciones y talleres, Planet Drum ayuda a iniciar nuevos grupos bioregionales; además buscando, con las organizaciones e individuos de la región, maneras de vivir dentro de los confines de una bioregión. Creemos que las personas que conocen y se preocupan por los lugares donde viven, se empeñarán en mantener y restaurarlos. Después de un terremoto de 7,2 y las lluvias de El Niño que destruyeron una gran área de la ciudad costera ecuatoriana de Bahía de Caráquez en 1998, la ciudad se comprometió, por medio de la ley, a ser ecológica y sustentable. El apoyo de Planet Drum a los esfuerzos de la ciudad ha sido a través de educación sobre la sostenibilidad y la reforestación de las laderas con plantas nativas, para que la erosión no destruya al estuario del Río Chone, que provee comida e ingresos para gran cantidad de los habitantes como también el hábitat de la flora y fauna local. Planet Drum Foundation ayudó a crear conciencia comunitaria de los problemas en Bahía cuando la ciudad celebró su Declaración de Ciudad Ecológica en 1999. Desde entonces hemos establecido una oficina de campo y un proyecto bioregional muy importante de revegetación; en un barrio de la ciudad y de las laderas del alrededor se plantan árboles autóctonos para controlar la erosión y evitar derrumbes, y también para crear un “corredor silvestre” urbano. Extendimos nuestra iniciativa educativa con el Programa de Educación Bioregional para niñas y niños del área, reuniéndolos dos veces a la semana en clases y viajes de estudio para aprender más sobre el medio ambiente local y cómo vivir sosteniblemente. Contamos con la ayuda de nuestros voluntarios en nuestro vivero, regando los árboles en los campos de reforestación, y participando en actividades comunitarias, las cuales suelen incluir el trabajo que hacemos con los estudiantes del Programa de Educación Bioregional. Los quehaceres del vivero incluyen: Sembrar las semillas, transplantar las plantas, mezclar la tierra, regar, sustentar el abono orgánico, y colaborar con estudiantes y docentes de la universidad. Las tareas vinculadas a la revegetación de los campos incluyen: cercar, abrir los senderos, regar, y plantar (i.e. ¡tienes que ser capaz de usar un machete y cavar un hoyo!). Este trabajo implica con frecuencia cargar peso (entre cuatro y ocho galones, o 15 y 30 litros, de agua) por laderas empinadas para regar los árboles jóvenes que hemos plantado. Buscamos individuos motivados que se dedican al medio ambiente y que no tienen miedo del trabajo arduo en un clima tropical. A los voluntarios que les interesa una estadía más larga (de dos a tres meses o más) se les anima a que inicien un proyecto individuo relacionado con el trabajo que hacemos aquí (ya sea en el vivero, o relacionado a la educación ambientalista o trabajo con la comunidad, etcétera). Se valora experiencia en educación y actividades ambientalistas y con viviendas cooperativas, también la habilidad de hablar en español. Sin embargo, las manos dispuestas y el deseo de ayudar a restaurar nuestra dañada biosfera son lo más importante. Debe ser de por lo menos un mes, preferiblemente entre dos o tres meses, con veinte horas de trabajo a la semana (lunes a viernes, ocho de la mañana hasta las doce de la tarde). Las tardes y los fines de semana son tiempos libres para descansar en la hamaca, relajar en la playa, surfear en la ciudad vecina de Canoa, nadar en el pacífico, visitar las camaroneras y fincas biológicas, ir en canoa a los manglares o cualquier otra cosa de interés. Los voluntarios son responsables de pagar sus propios pasajes, incluyendo las idas y venidas de los campos y del vivero en bus (es un gasto mínimo ya que los viajes cuestan $0,18). El alojamiento es gratis a cambio de servicio voluntario. En nuestra casa entran 6 personas y el director de proyectos en el campo. Los voluntarios son responsables por su propia comida y anticiparán gastar más o menos $10 en cenas comunales, agua potable, papel higiénico, etc. Además, Planet Drum pide que paguen $10 mensuales para cubrir los costos de desgaste natural. El departamento es grande con 3 habitaciones (2 son comunales para los voluntarios y una es privada para el director de proyectos), dos baños, una cocina, una sala grande con sofá, computadora (con dvd y mucha música), hamaca, mesa, etc.… El departamento se ubica en el centro de Bahía en el segundo piso con muchas ventanas que proveen una linda brisa para combatir el clima cálido. El río queda a dos cuadras y el océano a cinco cuadras de la casa. Justo a la vuelta están el mercado y varias panaderías. La comida aquí es buena y económica, con abundancia de mariscos. Las comidas en los restaurantes normalmente cobran $1,75 para una comida que incluye jugo, la sopa, y alguna elección de carne con arroz y frijoles. La ciudad es segura, limpia, y muy amigable. Las camas vienen con almohada, sábanas, y mosquetero. No hay teléfono ni acceso al Internet en casa, pero sí hay cafés de Internet cerca que cuestan más o menos $1 por hora y cabinas telefónicas con precios variados. Los voluntarios deben averiguar sobre las vacunas antes de llegar a Ecuador. No se requiere de los extranjeros que consigan una visa para estar en Ecuador hasta los 90 días. Estadías que sobrepasan este periodo serán multadas por lo menos $200, a menos que se haga una extensión del plazo o con una visa específica. Se puede hacer solicitud de visa de voluntario en cualquier consulado o embajada antes de llegar al Ecuador. Este trámite otorga una estadía más larga, pero se tiene que hacer el proceso desde el extranjero, y viene con costo. 1. Un currículum o una carta describiendo tu educación y tu experiencia vivida o del trabajo. ¿Qué habilidades y conocimientos has obtenido de tu educación, del trabajo, o del viajar, que pudieran contribuir a tu capacidad de trabajar en nuestros proyectos? 2. Un resumen de tus intenciones; por ejemplo, ¿qué es lo que esperas añadir a, o llevarte de, esta experiencia? 3. ¿En cuales fechas estarás disponible? 5. ¿Por qué te atrae este tipo de trabajo y cómo va contribuir esta experiencia a tu crecimiento personal? 6. ¿Te sientes cómodo/a con la vivencia compartida?